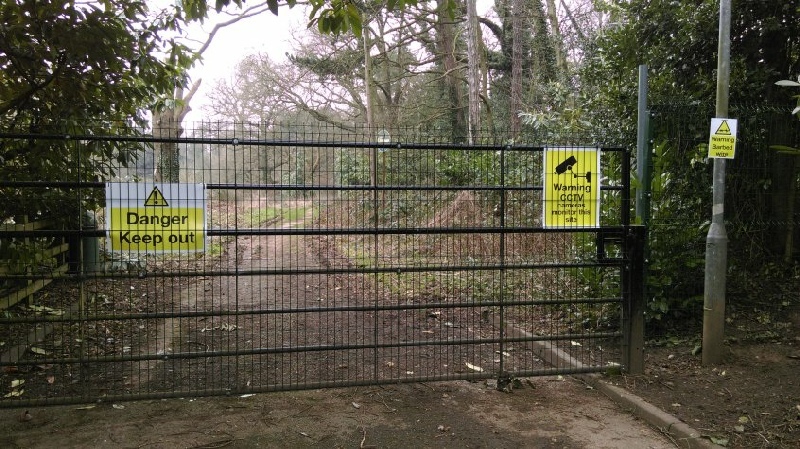 The footpath between Moss Drive and Bluebell Woods in Bramcote was permanently closed off in January, by the upgrading of the existing gates with the intention of blocking off ALL pedestrian access to Bluebell Woods beyond. Subsequently the fencing has now been extended sideways to prevent local residents gaining access around the sides of the gates. The second gate, located at the wood's end, has also been liberally smeared with grease. The landowners of this small piece of land are LawnsCo, a company involving three of the households within The Lawns development. At the time LawnsCo bought the land from the original developer their stated aim was to continue to protect it as green belt and from any possibility of any further development in the future. That consideration has now changed to one of profitable development, with an application to build five grand and extensive apartments on our protected green belt land. The piece of land is within our precious local green belt and Bramcote Conservation Area and the application for a Lawns 2 development has been refused by our local planners on two separate occasions. LawnsCo previously stated that a lack of local support for their planning application would result in the removal of permissive access to the land. This has now happened, even though local opposition was not among the reasons for the refusal of the planning application. To create a permanent public right of way we need to prove that there has been continuous unobstructed pedestrian access over a period of at least 20 years. This was the case during the 1970s, 80s and 90s. When the University owned the land there were no gates and they were, and still are, happy for the public to have permissive access to and through the woods and scout field as long as the area is treated with respect. About 10 years ago the two field gates went up over the path in question to stop abuse by cars and motorbikes, pedestrian access was still allowed. Bramcote Conservation Society is leading the effort to bring this route back into pedestrian use and would be grateful for anyone who has used the route in the past to fill in one of the council's forms. This is the ONLY way that future access can be guaranteed. You can download the form and map here by clicking on the words. When complete please return both of them to 15 Cow Lane.